She reiterates her Bernie Sanders-esque call for a $15 per hour minimum wage, universal health care and paid family leave while adding that high speed internet access is critical for everyone in Vermont, even those who live in the state’s most rural areas. Hallquist, Vermont’s Democratic candidate for governor, argues that Republican Gov. 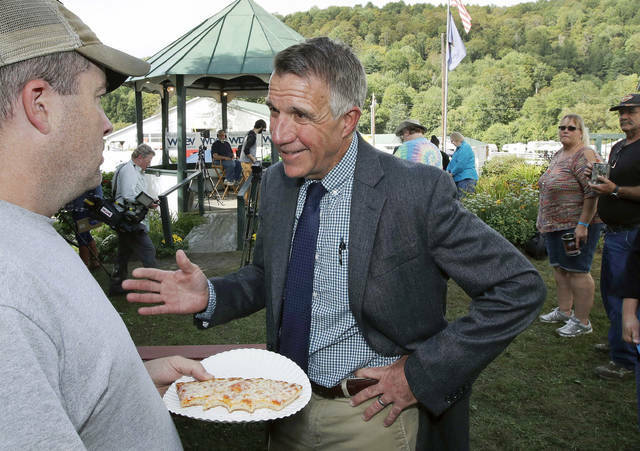 Phil Scott vetoed a series of legislative calls to address those economic issues and that he doesn’t understand just how critical high-speed broadband is for the state. 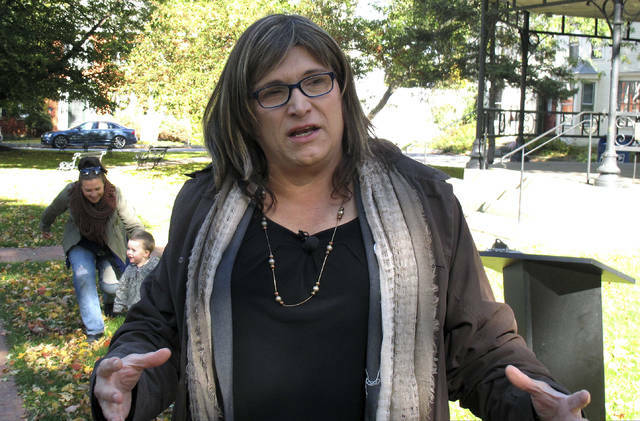 What Hallquist, who until she announced her candidacy for governor this year led a rural electric cooperative, doesn’t mention is her status as the nation’s first major-party transgender gubernatorial candidate. Within the state, her campaign is focused on the issues facing Vermonters, but looking at her race from outside, she proudly carries the mantle as a way to reduce stigma. After winning the Democratic nomination in August, Hallquist, 62, received death threats from across the country. Since then, she is unaware of any others and she says the people of Vermont are focusing on her ideas. Prior to the Vergennes rally, Greg Burdick, 68, a Republican and part-time city employee who also works in real estate, said as he was walking by the park that he was backing Scott because, among other reasons, he liked the governor’s position of no increased taxes. Before the primary, The Victory Fund, a Washington-based political action committee that backs LGBTQ candidates across the country, rated Hallquist a “game changer.” The organization says Hallquist is one of at least 244 openly LGBTQ candidates who will appear on the ballot across the country. By historical standards, Hallquist’s quest to defeat a first-term incumbent is quixotic. No sitting Vermont governor has been defeated since 1962, and Scott, whose first political ad calls for a return to civility in politics, remains liked. A poll released Monday by Vermont Public Radio and Vermont Public Television, gave Scott a 14 point lead. Scott, the former owner of a construction company and a part-time race car driver, spent his first two years saying the best way to help Vermont’s struggling families is to keep taxes and fees low for everyone, while minimizing what he feels are governmental burdens on job-creating business owners. But as a popular Republican in liberal Vermont, Scott is also a frequent critic of President Donald Trump, is liberal on many social issues, and last winter, after what police described as a near-miss school shooting, he urged the Legislature to pass what turned out to be the state’s first significant gun ownership restrictions. While the move angered many of Vermont’s fervent gun owners, it won him praise from others who favored the restrictions — mild by the standards of other states. The election isn’t drawing the money of the 2016 race, when Scott was competing for an open seat. As of the Oct. 15 campaign finance filing deadline, Scott had raised just over $560,000, while Hallquist had raised just under $440,000. At the same point in the 2016 campaign, Scott had raised just over $1.3 million, while his Democratic opponent, Sue Minter, had raised $1.7 million. During a series of debates Scott and Hallquist have gone back on forth on their political philosophies and vision for the future of Vermont. “Vermonters have a real choice,” Hallquist said during one debate. People are listening to the debate. Disclosure statement: Jeffrey Lazarus does not work for, consult, own shares in or receive funding from any company or organization that would benefit from this article, and has disclosed no relevant affiliations beyond their academic appointment. Even before the ink on the United States-Mexico-Canada Agreement (USMCA) was dry, the debate around which countries won and which countries lost was in full swing. U.S. President Donald Trump, President Enrique Pena Nieto of Mexico and Prime Minister Justin Trudeau of Canada have been busy framing the new deal for their constituents, but what has largely been overlooked is the promise that comes from each country reaffirming a shared belief that we are all better when our North American economy is integrated. Our continent has been a global economic powerhouse for decades and the USMCA — while not perfect for any one country — encourages the kind of collaborative give and take that’s needed to create jobs, foster innovation and improve quality of life for more of our fellow countrymen and women. Nowhere is that spirit of collaboration and connectivity more evident than in the border economies that dot our hemisphere. North America is home to a handful of rapidly growing border regions that punch above their weight — and overcome occasional tendencies toward protectionism in each of our countries — to build hubs of economic activity that can drive opportunity and prosperity across North America. These border regions have long been sources of human capital and innovation. Under the USMCA, there’s opportunity to accelerate their growth even more for the greater good. —Recognize that these regions are already massive hubs of economic activity that benefit both sides of their borders. This sentiment is already driving officials in Seattle and Vancouver, Canada, to launch a high-speed rail connecting both cities. The effort will generate more than 150,000 jobs per year and more than $600 billion in business output. A similar phenomenon is taking place along the southern U.S. border connecting California and Baja California. This border region has grown significantly over the last decade and now represents more than $255 billion in combined gross domestic product. Companies are increasingly locating and growing in this region, and talent from both sides of the border is driving innovation and helping meet much-needed demand for human capital. This rapid growth is one of the reasons the San Diego-Tijuana border is the busiest land crossing in the Western Hemisphere with more than 125,000 vehicles and 63,000 pedestrians crossing the border every day for work, education and more. A great example of the dynamic of these two border cities is the Cross Border Xpress, the first ever skywalk to connect a facility in the United States directly into a foreign airport terminal (Tijuana). —Embrace the increasing global significance of these regions. Border communities certainly hold regional power, but the cross-border collaboration inherent to these regions give them out-size economic influence on the global stage. Take Baja California. This state on the Mexico-U.S. border is now home to 900 manufacturing companies from around the globe in growing sectors including aerospace, automotive, technology, medical device manufacturing and more. This includes companies from the Europe, Japan, China and, of course, the United States. Industrial activity in Baja California increased 5.6 percent in the past year, well above Mexico’s national average, placing it as the No. 1 border state and seventh nationally in terms of growth. Increasingly so, many of these companies have incorporated higher value-added processes, evolving from mere cost centers to strategic business assets. —Engage universities to feed long-term economic success. As is the case in Silicon Valley, Research Triangle in North Carolina, or the biotech hubs of Massachusetts — universities along borders are also nurturing talent and creating the next generation of innovative professionals. Border regions can serve as innovation clusters when academic institutions are collaborating closely with business leaders. These alliances have helped make the San Diego, Tijuana and Mexicali cross-border economy an example of what’s possible elsewhere in North America. My institution — CETYS University — is becoming a brain magnet for the entire region, and that makes us as important to the United States and the world as we are to Latin America. Our faculty members and students are at the forefront of entrepreneurship and innovation and many of them travel between the United States and Mexico every day. Success has come in part through innovative partnerships for strategic human resource development that include local governments, corporate leaders and universities on both sides of the border. Examples range from medical technology graduate programs developed by our faculty in collaboration with St. Cloud State University and Medtronics, to a joint project with UC San Diego to support the semiconductors industry or other collaborations that develop talent for a growing aerospace sector. These partnerships demonstrate what’s possible through intentional transnational collaboration. So, let’s stop debating which countries won and which countries lost under USMCA. All our countries are better when we’re integrated and innovating for a brighter North American economy, acknowledging the promise of collaborative effort to drive continued growth. Fernando Leon-Garcia is president of CETYS University, a leading private university system in Mexico. He previously served as chancellor of City University of Seattle’s International Division. He earned his doctorate from Stanford University. He wrote this for InsideSources.com. COLUMBUS, Ohio – HackOHI/O 2018, The Ohio State University’s sixth annual 24-hour hackathon, is the reason more than 800 students will code, build and innovate around the clock in the Ohio Union Oct. 27–28. Hackathons are technical project marathons where student teams go from idea to prototype in a single weekend, solving a problem or meeting a need in the marketplace. HackOHI/O is the largest in the state. Students from Ohio State and other Midwest schools will converge on Columbus to spend the weekend building novel technology apps, devices and projects. After 24 hours of “hacking,” the teams at HackOHI/O will present their ideas to fellow students, faculty, and tech company representatives. Teams will be judged on categories including technical difficulty, creativity, usefulness and presentation. Nearly one hundred industry professionals interested in the talent and technology on display also are expected to attend the final showcase on Sunday, Oct. 28, when more than $10,000 in donated prizes will be awarded to the most innovative projects. The showcase is open to the public. “This year we’re emphasizing to the students how this short-term event can be a launching pad for long-term entrepreneurial ambitions,” said program director Julia Armstrong. “And we’re encouraging projects that have real-world impact.” She added that more freshmen and majors outside of computer science have signed up this year, which she attributes partly to partnership with the Ohio State Digital Flagship initiatives. Engie, Ohio State’s energy partner, is issuing a Smart Campus challenge addressing the gamification of energy awareness and usage reduction for students and staff on campus. JP Morgan Chase, long-time supporter, is sponsoring the Best Hack for Disaster Relief and Recovery, focusing on communication to population, resource allocation and safety.